The BEST Pet Tartar Remover! Suzie’s Pet Tartar Remover is the original pet tartar remover and still the best! Suzie’s Tartar Liquid . . . Adjust the Ph level of pet’s saliva. It’s simple to use! Just add to your pets water. Helps fight pet periodontal disease. I just had to tell you how wonderful Suzie’s Tartar Liquid works! 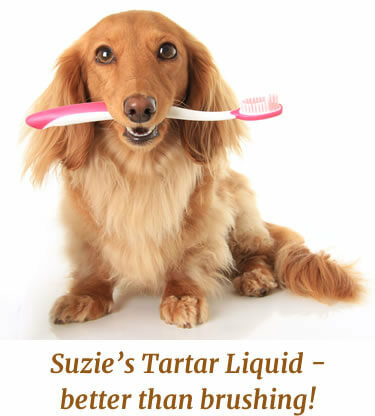 When my dog was 8 months old a friend of mine told me about Suzie’s Tartar Liquid. She had been using it on her 2 year old lab with great results. My dog, Larry, had very white teeth because he was still so young but seeing how well the product worked for my friend I figured and ounce of prevention was worth a pound of cure! I get so many compliments to this day on how white Larry’s teeth are. Thanks for making such a great product, Larry and I really appreciate it! Dog & Pet Tartar Remover That Really Works! Welcome to Suzie’s Pet Supplies, home of the original dog tartar remover! Our tartar liquid works wonders for your pet, allowing for better breath and a healthier smile. While our company was founded back in 1998, our pet and dog tartar remover had been around for nearly a quarter of a decade. Suzie’s Tartar Liquid changes the Ph levels in your pet’s saliva from acidic to alkaline. In short, our dog tartar remover reduces the amount of acidity in saliva, directly impacting nasty tartar buildup and bad breath. See how it works here! Reducing tartar is more than a cure for bad breath. The actual cause of poor breath can be detrimental to health, including heart disease and kidney failure. Suzie’s Tartar Liquid is easy to use and can help combat the negative consequences of tartar buildup. Trust our dog tartar remover to do the trick for your pet! Buy Suzie’s Tartar Liquid Today!